No matter if it’s the corner grocer, a local restaurant, or a huge mega-corporation, building a successful business is all about building relationships. You’ve got to give your customers something special, something unique, something that they can get only from you. And, if you do that well, they won’t just buy what you’re selling, they’ll come back to purchase over and over and over again. If you really want to build a huge, successful business, you’ve got to create your own product, build your own brand, create something that is truly unique – something that your customers can only get from you. Fortunately, there’s a business model that – with new software and Web 2.0 technologies – makes creating a unique product and building profitable relationships easier than it’s ever been before. That business model, and that simple solution, is a membership site. 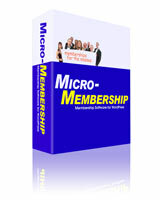 Micro-Membership is a membership and subscription plugin designed specifically to work with WordPress to give you a highly-functional, low-cost solution for creating unique, compelling, and entertaining online communities that your subscribers will love..